Labor day is drawing ever closer and my home and garden magazines are chock full of delightful “fall” desserts, tempting me to bake pies and breads and cookies! Tempting as all those recipes are, it’s still too hot for me to consider having my oven on for more than a quick broil here and there, so I was thrilled when asked to try out the latest THINaddictives cookies from Nonni’s. We got to indulge our sweet tooth with dark chocolate almond thins when I received a complimentary box of items from Nonni’s who did the baking for us. If it’s still too hot for you to bake sweet treats as well, then this giveaway is for you! All opinions expressed are my own. Made for dark chocolate lovers wanting a guilt-free treat, each cookie is lightly drizzled with real, dark chocolate. My daughters liked these best, noting they could tell these were made with real bananas and the dark chocolate drizzle had just the right amount of sweetness. These were my favorite, which came as no surprise to anyone! I love dark chocolate and almonds! I love that I could see and taste the chunks of almonds. These were my husband’s favorite, with good reason. The flavor profile is subtle, yet very tasty. He wants to pair them with some cream cheese and grapes. I served each flavor of Dark Chocolate Almond THINaddictives with fruit for and afternoon snack and found it a delightful flavor combination! I can feel good about my family enjoying these since each treats average 70 to 80 calories and come in pre-portioned freshness packs with two almond thins each, making it the perfect on the go snack for busy families! I invite you to learn more about the Nonni’s brand by getting social with them. As a small business owner, I’m always intrigued by the family behind the brand. Learn more about their newest line of THINaddictives featuring dark chocolate and almond here. Be sure to visit them on Facebook and Twitter as well. 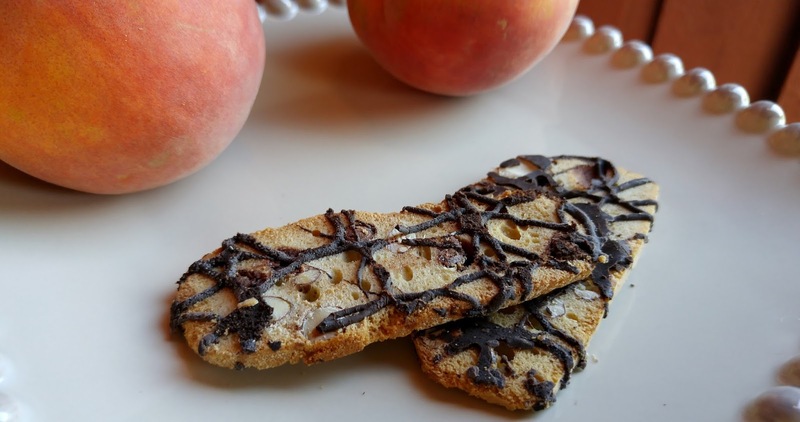 Would you liked to indulge your sweet tooth with Nonni's Dark Chocolate Almond thin cookies? 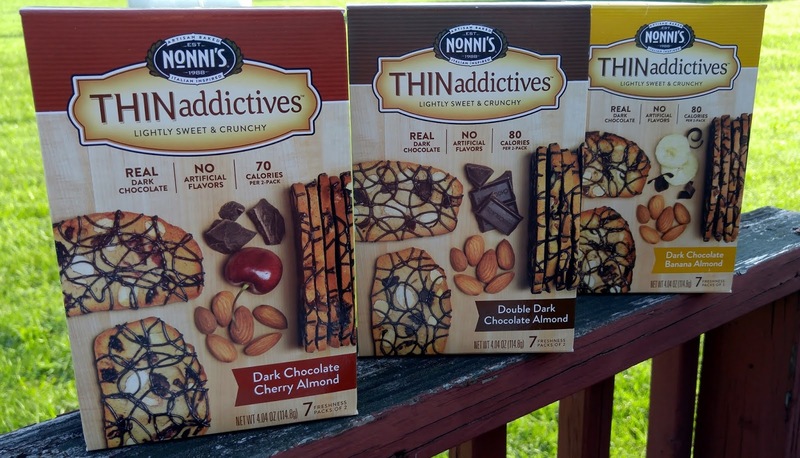 Thanks to the generous folks at Nonni’s, one lucky winner will receive one box of each new Dark Chocolate Almond THINaddictives (3 full size boxes with 7 pouches each). No purchase is necessary to enter using the Rafflecopter from below. My WAHM Plan is not responsible for prize fulfillment. Winners will be notified by email used on entry form and have 24 hours to respond or another winner will be chosen. This giveaway is not associated with nor endorsed by Facebook, Twitter, or any other social channel. Please share in comments: Which new dark chocolate almond THINaddictives flavor will you try first if you win? I think I'd try the chocolate banana first -- reminds me of banana bread. These look delicious. I'm fascinated by all the "thins" in the store now -- thin Oreos, etc. I am crazy about dark chocolate and these cookies look delicious! I would try Dark Chocolate Almond Banana because the choco-banana combi is my favorite!! I would like to try the double dark chocolate, looks great! I would like to try the Double Dark Chocolate Almond flavor. My daughter said the ones with banana reminded her of banana bread too, so you are in luck. Thanks for entering! These are so good and going fast at our house. Good luck! 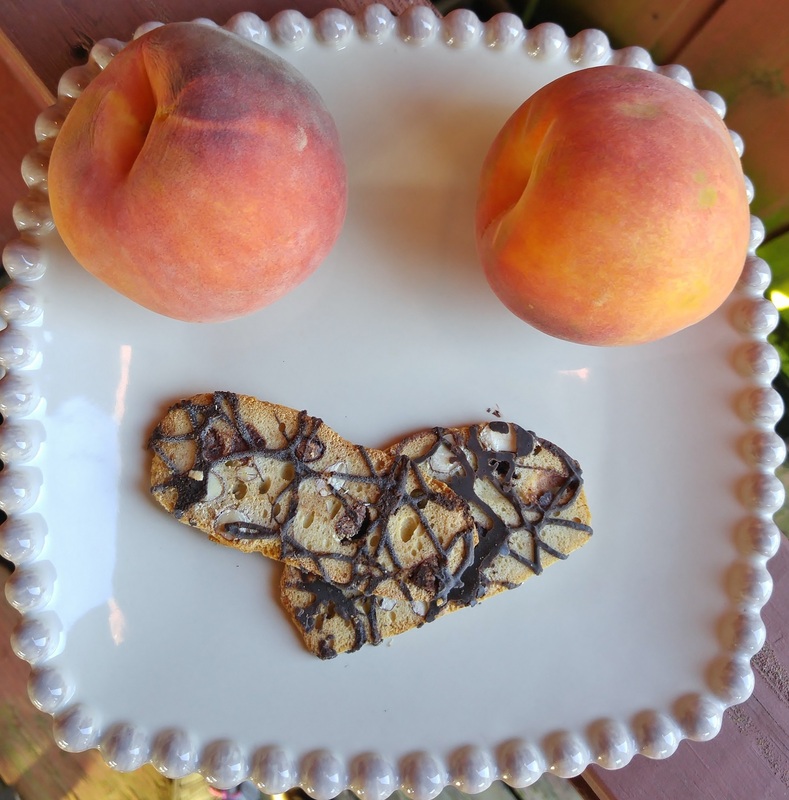 The double dark chocolate thins have been claimed off limits by this Mom here! Good luck and thanks for stopping by! Double Dark Chocolate Almond sounds good. I have not heard of these. I would like to try. Double Dark Chocolate Almond is going to be on my mind because I LOVE ALMONDS! I would first like to try the Double Dark Chocolate Almond flavor. I would love to try the dark chocolate cherry almond flavor! I'm most excited about the Dark Chocolate Banana Almond ones! I am most excited to try the dark chocolate cherry almond flavor. They all sound amazing but I think the Double dark chocolate almond is calling my name. They sound fantastic! The Dark Chocolate Cherry Almond sounds delicious! I wouldn't turn down the others but I'd dive into that one first. I'm intrigued by the dark chocolate banana almond. I am most exciting to try Dark Chocolate Almond. Double Dark Chocolate Almond: every single word is exactly what I want on a sweet snack! Dark chocolate is my favorite, bring on "double" it! And you can't go wrong with almonds, they add just enough texture to make anything wonderful! I'd love to try the Dark Chocolate cherry almond. I would love to try the Dark Chocolate Cherry Almond. I would like to try the Dark Chocolate Cherry Almond. I would like the Double Dark Chocolate Almond.